AH! We LOVE THESE! I basically change up our go-to's to make this an interesting, quick midweek meal. Heck, you can even eat these in the car on the way to soccer! I'll keep it simple because really, you can take this & make it your own. These are beautiful, fun & tasty! I'll share a few variations in this post. First of all, you start with a muffin pan & eggroll or wonton wrappers. The eggroll wrappers are big & wonton wrappers are small. I use the big ones to make bigger cups. 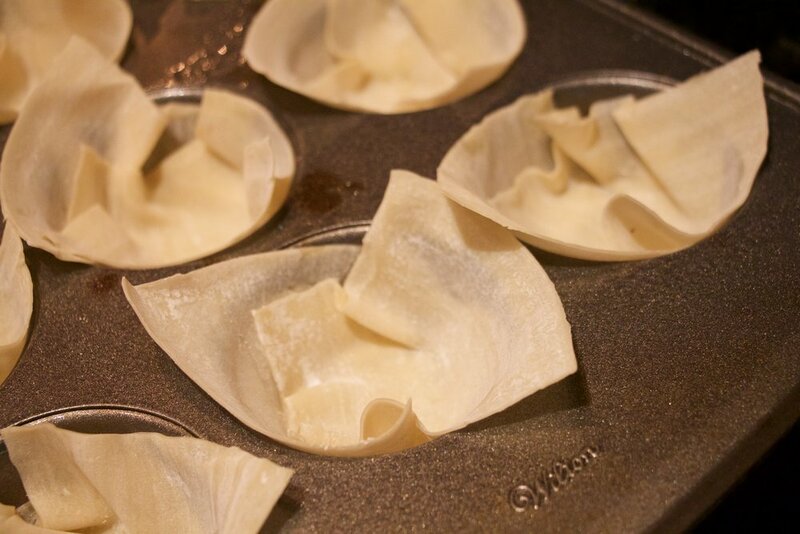 When I'm using the wonton wrappers, I'll have a few in each muffin slot to create the cup. You'll also notice that I have 3 different sizes of muffin pans. All work for whatever you want to make. Fill with beans in the bottom, beef, & toppings! BOOM! This is a little different. If the filling needs baked, bake it with the wrapper. THEN BAKE at 350º for 15-18 minutes. Depending on your oven. Be careful to cook the filling all the way without burning your wrappers. 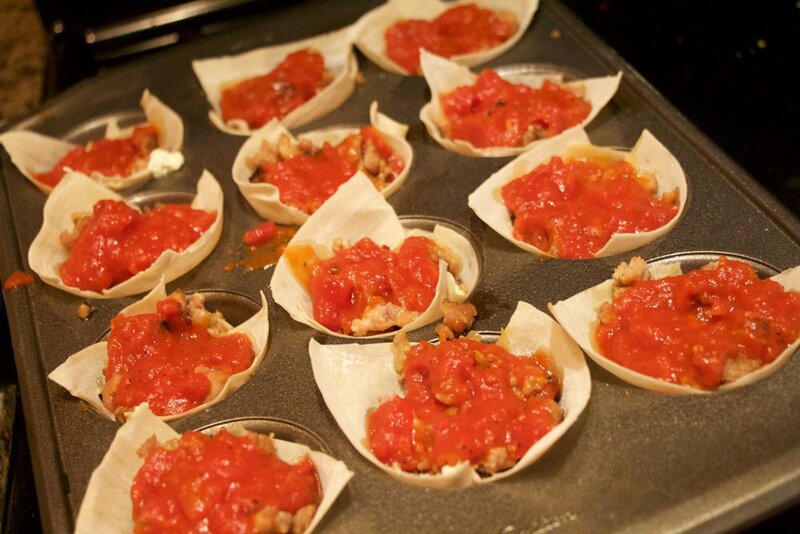 Like the lasagna cups, the egg filling needs baked...so you will bake it with the wrapper. These work great at room temp. So throw them together & run off to your next breakfast! These saved me recently when we had a big family dinner! My daughter asked me to grab Nutella at the store & while I was shopping & pulled it together in time! 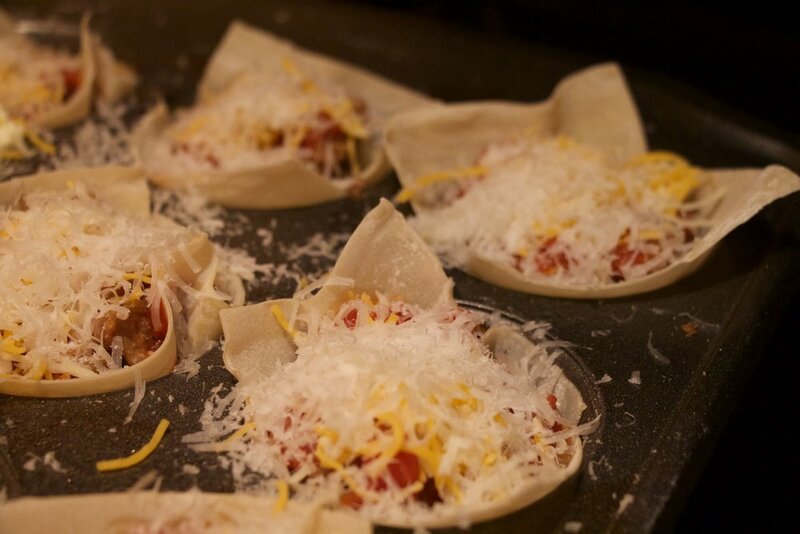 Spray, spray & bake at 325º, then fill & top 'em. You're getting the hang of it! Shake powdered sugar through a fine mesh strainer to make it beautiful! Your turn!!! Next time you stock up on groceries at the store, just throw these wonton & eggroll wrappers in your cart. They'll save you & spark new ideas when you're in a funk or bind! I forgot to mention that you can find them in the produce section, near bagged salads & mushrooms. Good luck & be creative!